While most contenders in this segment reflect a scaled-down SUV approach, the new Honda HR-V combines the sleek aesthetics of a coupé-inspired design with the rugged attitude of a sports utility vehicle, and the space and versatility of a MPV. At the same time, the HR-V retains all the coveted hallmarks of the Honda brand, including innovation, tactile quality, reassuring safety and an engaging motoring experience. The all-new HR-V has a highly individual exterior design, thanks to the pronounced curve of the roofline, which creates a unique, coupé-like impression. However, the short overhangs, raised stance and wide tracks reflect the rugged attitude typical of a SUV. The front-end treatment is unmistakably Honda, with tapered headlights framing a V-shaped grille in contrasting charcoal, while a meshed lower air intake adds further visual aggression. A pronounced swage line, crisp contours and emphasised wheel arches add to the head-turning presence of the newcomer. The tidy rear-end treatment is dominated by the large tail light clusters, a tailgate that opens all the way down to bumper level, and a bumper finished in contrasting charcoal to further underscore the HR-V's rugged attitude. Alloy wheels and slim roof rails add a classy touch. Despite its compact footprint, the HR-V looks and feels spacious inside. The interior execution focuses on intelligent packaging to deliver a spacious front and rear cabin, while the luggage compartment offers generous stowage space. Honda's unique Magic Seat system, already a hugely popular feature in the Jazz and Civic models, is also included, adding further practicality and flexibility to the interior. With the seats raised, the luggage compartment offers 393 litres of boot space up to window level, while folding the split rear seat flat increases cargo capacity to an impressive 1 002 litres. 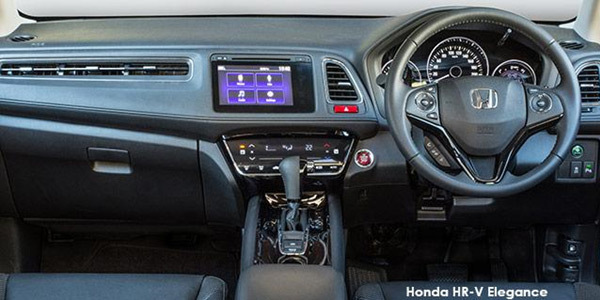 Practicality aside, the HR-V cabin's execution is smart and contemporary, with the raised seating position providing excellent all-round visibility, while the controls and switchgear are ergonomically arranged for ease of use. High-grade finishes create an upmarket, sophisticated ambience. The new HR-V offers an extensive list of comfort and convenience equipment across the two-model range. Highlights include electrically operated windows and mirrors, remote central locking, air-conditioning, cruise control, a multi-function steering wheel and a multi-information trip computer. Depending on model, the new HR-V's integrated infotainment system is controlled via a 5-inch monitor, or a 7-inch colour touchscreen display. Both systems feature Bluetooth connectivity for hands-free telephony and audio streaming, USB connections, a CD player, and multiple speakers. The new HR-V is equipped with an electric parking brake, combined with an auto brake hold function. The electric parking brake is engaged via a switch on the centre console, and automatically releases when the accelerator pedal is pressed. The auto brake hold function engages automatically after the vehicle has been braked to a standstill, and the brake pedal is released. The hold function is disengaged as soon as the accelerator is activated. However, if the brake hold function remains activated for an extended period of time, for instance in a traffic jam, the electric parking brake will be engaged instead. Again, pressing the accelerator will then disengage the electric parking brake. Safety is comprehensively addressed via an extensive array of passive and active safety systems. Passive measures include six airbags, head restraints, inertia reel seatbelts for all seating positions, and Honda's Advanced Compatibility Engineering (ACE) body structure. Active systems include ABS anti-lock brakes with Electronic Brake Force Distribution (EBD), Emergency Brake Assist (EBA) and Emergency Stop Signal (ESS) activation, as well as Vehicle Stability Assist (VSA), Hill Start Assist (HSA) and a high-mounted LED rear brake light. The new Honda HR-V is available with a choice of two efficient petrol engines, both linked to a new-generation, Earth Dreams technology Constantly Variable Transmission (CVT). Regardless of engine, drive is to the front wheels. 1.5 Comfort. The fuel-injected unit's maximum power and torque outputs come to 88 kW and 145 Nm respectively. For the more upmarket HR-V 1.8 Elegance, Honda has chosen a 1 799 cc four-cylinder engine, also boasting electronic fuel injection, and credited with 105 kW of maximum power, while maximum torque is 172 Nm. Start/stop functionality benefits economy and CO2 emissions. The CVT common to both models features the latest control logic to achieve a direct and linear response reminiscent of a manual gearbox. The standard shift paddles allow manual override for an even more engaging driving experience. The CVT's updated control software simulates seven virtual gears, and optimises gear changes for specific driving styles and conditions, thus always making the most effective use of the engine's output. Fuel efficiency also benefits as a result. Under the skin, a highly rigid monocoque employing a significant proportion of high-tensile steel creates a stiff platform for the independent, MacPherson strut-based front suspension, and torsion beam rear, ensuring effective damping. Electric power steering is standard in the interests of overall efficiency, while a lower front and raised rear roll centre benefits overall stability and neutral, confident handling traits. The ABS braking system features discs all round. 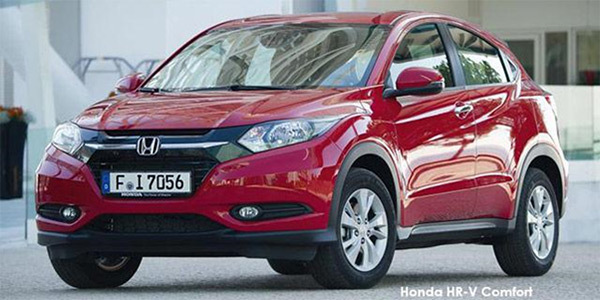 The locally available Honda HR-V range consists of two models, with the 1.5 Comfort variant on offer initially. This model is comprehensively equipped, with exterior highlights including halogen headlights and front fog lamps, roof rails and comprehensive colour coding. The interior features cloth upholstery and soft-touch surfaces and finishes, creating an inviting, upmarket ambience. Front cupholders, a glove compartment, door panel pockets and a front centre armrest are all standard as are illuminated vanity mirrors. The Comfort derivative gets a 5-inch monitor providing the interface between the HR-V's occupants and the on-board infotainment system. It includes a 150 watt, four-speaker sound system, USB and AUX inputs, as well as Bluetooth connectivity. An alarm system with integrated immobiliser provides peace of mind. The 1.8 Elegance offers all the standard features of its 1.5 Comfort stablemate but augments the list with some additional upgrades. These include larger alloy wheels, and auto-activating LED headlights with daytime running lights. Inside, the Elegance gains leather upholstery and a leather-trimmed steering wheel, automatic climate control, heated front seats and a rear armrest. The 5-inch monitor makes way for a 7-inch touch screen display with rear-view camera. The display allows access to a raft of advanced features, including a more powerful integrated ound system with six loudspeakers. Honda's Smart Entry system allows remote locking and unlocking, and only requires the push of a button to start the engine. 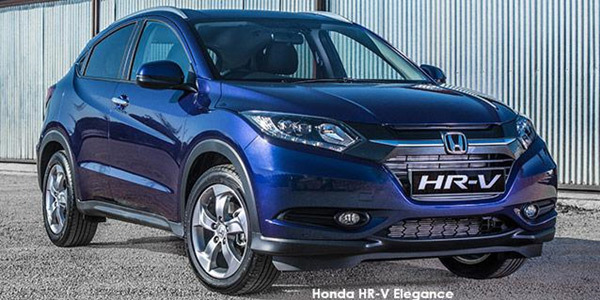 The new Honda HR-V is offered in a selection of seven colours: Ruse Black, Crystal Black, Carnelian Red, Morpho Blue, White Orchid, Alabaster Silver and Modern Steel.